At present, there are two major reasons for archaeological investigation. Firstly, it is the academic interest; however, the number of such works is rather low. Secondly, it is the numerous construction activities which demand rescue excavations to preserve archaeological monuments. Archaeological sites are selected according to several sources. Literature and reports describe already known sites or important finds. During survey examination of the surface, other finds may be uncovered. Usually, these are pieces of ceramic vessels, animal bones, or solitary stone or metal tools. Another source thereof is aerial photography which may identify individual settlements and graves and their extent. Geophysical survey, searching for anomalies in the ground, is also a very important indicator of human activities. All these techniques lead to final selection of sites where prehistoric or medieval settlements may be expected. After the survey, excavators arrive to the site to scrape off the layer of topsoil. Archaeology is a discipline which uncovers, dates, identifies and interprets material monuments, reconstructs the development of human society in the past, for which we do not have enough written sources. Removal of topsoil on D 0134.3 motorway KromÄÅÃ­Å¾ â East (September 2003). 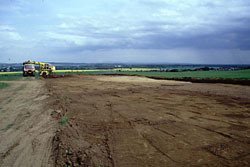 Archaeological features may only be found in subsoil for their different colour. Usually, they are of brown colour and its ground plan has a rounded, oval or rectangular shape. The shape also indicates their function. Olomouc-SlavonÃ­n âHornÃ­ lÃ¡n". 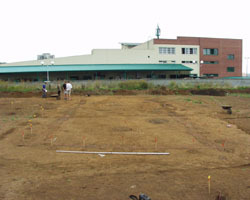 A ground plan of a house from the middle Bronze Age (15th century BC) uncovered at a supermarket construction site, summer 2001. 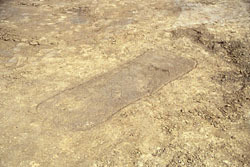 Olomouc-Nemilany â a ground plan of a Slavic grave (9th century AD) uncovered at a D 3509 motorway construction site, April 1999. Archaeologists and their assistants investigate the content of these features. They carefully remove the soil and record discovered artefacts. Investigated features are recorded in several ways: in drawings, pictures or films. The overall map of sites is made through a GDM survey. Olomouc-SlavonÃ­n âHornÃ­ lÃ¡n". A GDM survey, summer 2001. Uncovered artefacts are put into bags, marked, cleaned and taken to a laboratory for preservation. All artefacts are first carefully washed and then divided into groups: pottery, bones, stones, tools, metals, cinders, etc. Bones and cinders are analysed by experts in their respective fields. 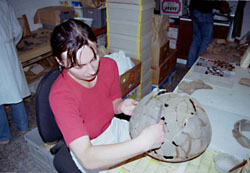 Pieces of pottery can be put together (with additional use of plaster) into a vessel. Metal artefacts are cleaned from rust by chemical or mechanical means and preserved with a special chemical technique. Each artefact is given an inventory number for later identification. Important assemblages, e.g. grave assemblages, are carefully recorded in drawings. A reconstruction of a ceramic vessel. All collected data is put into a report on finds which is later, together with all finds, taken to a museum depositary. 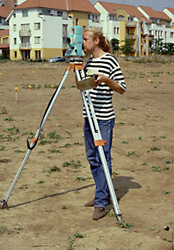 Results of field observations are further used in later investigation. Most recent results are publicised in a form of written works, museum exhibitions, lectures, etc.